Urban wine bike tour? Yes. We're crazy about Willamette Valley wine, bikes, and Portland. With an explosion of wineries within Oregon, many right here in Portland, it was easy to put one (or several!) together. We'll meet you only blocks from a few such wineries, in the inner SE industrial district, where we'll fit you with a bike and a helmet and talk wine. Due to limited opening hours for some wineries, routes vary, but stick mostly on the eastside for 8-10 miles of biking, under bridges and through gardens and industrial areas, past vineyards growing in urban pockets, straight into barrel rooms behind trainyards. We'll have the opportunity to taste at three wineries (tasting fees not included), and your guide will provide background about Oregon's wine industry, and anything else you need to know, and lots of enthusiasm over our amazing city wines: you'll taste Pinot Noir and big reds too! Fitted bike, helmet, and vegetarian snacks provided. Meet in inner SE Portland. Your tour begins at 3:00 p.m. at our bike shop in inner SE Portland, 811 SE Main, nestled among Portland's best coffee roasters, chocolatiers, breweries and restaurants. We'll meet you there and fit you for a bike and a helmet while we get to know you and your wine tastes -- our guide will vary the winery lineup not just based on the availability of tasting rooms (some wineries are open very limited hours), but also on your preferences. Once you are fitted, you and your group will ride up Portland's major North Portland bike corridor well into our fifth quadrant and to one of our small, passionate wineries, along the industrial east side of the Willamette River. Based on the day, we'll taste at Seven Bridges, Jan-Marc, or another winery. 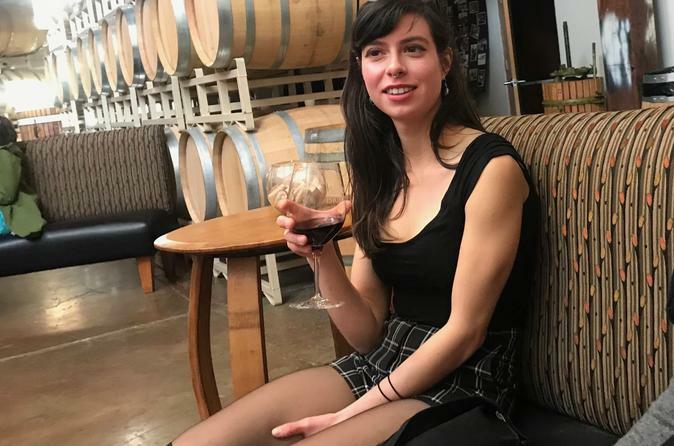 If you're an experienced wine connoisseur, feel free to pepper your guides with questions about the Willamette Valley, where they've been involved with the wine industry for half a decade; if you're entirely new at this, ask them to walk you through your tasting, describing all the pieces that make up your experience of this one sip of wine. We love to help you figure out, not just which of the urban wineries you might love best, but also which variety and style of wine makes your palate sing. Get back on your bikes and ride into Southeast Portland, through neighborhood streets lined with front yard vegetable gardens and fruit trees, where we'll visit one or two urban wineries that display a very wide selection of different styles of wine, including Alsatian and sparkling varieties, as well as the Willamette Valley standards: Pinot Noir, Pinot Gris, Riesling and Chardonnay. Teutonic Wine Company is a regular stop, and we may visit an additional winery in this neighborhood if time allows. From here, we'll return to our inner SE industrial neighborhood. Our last stop will be near enough to the shop to walk back if you've decided to have a glass of wine; we're happy to do the logistics here and return your bike for you! Tasting fees at wineries range from $10 to $15, and are typically waived with bottle purchases. We'll provide vegetarian snacks along the way. You'll return to the shop between 6 and 7, near enough to a wide variety of restaurants, breweries and distilleries to stroll to dinner or a show afterward. Or you can hop on our Portland at Night Bike Tour and do Portland the way we do: by bike!